David Dvorscak is the director of theatre programs, the Upper School theatre teacher and the speech and debate teacher. Fondly known as "Mr. D", he has been working at Carolina Day School since 2007. David began his teaching career with six years at St. Andrews-Sewanee School, teaching theatre in grades 7-12. He spent the next 14 years at Hollins University as the chair of the theatre department. 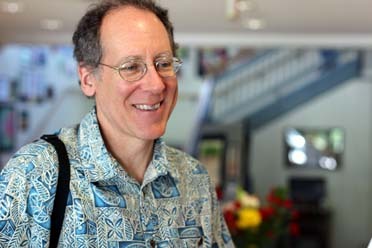 Much of his teaching methodology is founded in Viewpoints Technique: he trained directly with one of its founders - Anne Bogart. David has acted, directed productions, and choreographed stage combat for 28 years at professional and academic theatres across the country. David was the recipient of Dan Scarborough Award in 2012, and an Excellence in Acting award in 2011 from the Southeastern Theatre Conference. - “On ne voit bien qu’avec le coeur. L’essentiel est invisible pour les yeux” Translated – “It is only with the heart that one can see rightly, that which is essential is invisible to the eye.” From “The Little Prince” by Antoine de Saint-Exupery. - “Thank you for your work” I learned this from a very distinguished theatre director who made it a point to say this to each individual at the end of every rehearsal. This included the janitor, the intern who went for coffee, the star actor - anyone who contributed to the work that day. This is how we end all rehearsals at CDS. - “When someone seeks," said Siddhartha, "then it easily happens that his eyes see only the thing that he seeks, and he is able to find nothing, to take in nothing because he always thinks only about the thing he is seeking, because he has one goal, because he is obsessed with his goal. Seeking means: having a goal. But finding means: being free, being open, having no goal.” Herman Hesse.